Description : There are well known benefits of salt on the human body , especially for people suffering from respiratory diseases. Many people from other countries and from the US thought it would be interesting to bring the benefits of saline closer to us. Thus appeared the salt rooms , which we can now find in our country in the form of treatment centers. It would be one step ahead if you imagined a client who would transform a room in his own home into a therapy room where to relax when he wants to with his family . Needing a small space , the costs are considerably lower than a spa or than salt baths. It would be an interesting service : for a fee , a team of specialists would transform one room into a true health room at your own home. Salt Rooms can be built by two methods: 1 . By gradually pouring layers of sea salt or 2 . By building brick walls from Bulgarian salt bricks . Salt for both processes that can be bought in stores nearby salt mines . The costs for small amounts are very affordable. Conclusions: In a world increasingly polluted with waning life , such a service could be very successful , the condition being that the process is well documented and well executed. 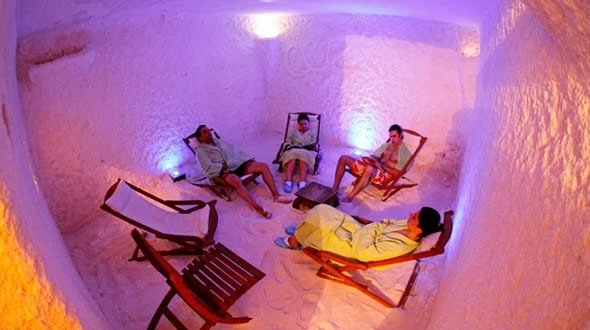 0 Response to "Business Ideas : Salt rooms "